What Facts Should I Know about Ankylosing Spondylitis (AS)? What Causes Ankylosing Spondylitis (AS)? What Are Symptoms of Ankylosing Spondylitis (AS)? What Exams and Tests Diagnose AS? Are There Home Remedies for AS? What Is the Orthopedic Medical Treatment for AS? What Is the Follow-Up for AS? What Is the Medical Definition of Ankylosing Spondylitis (AS)? Ankylosing spondylitis (AS) is a chronic inflammatory disorder of the spine and the area where the spine connects to the pelvis (known as the sacroiliac joints). How Do You Test for Ankylosing Spondylitis? Sacroiliac joint involvement is considered the hallmark of this disorder and is a requirement for diagnosis. Is Ankylosing Spondylitis a Form of Arthritis? Ankylosing spondylitis is categorized as a seronegative spondyloarthropathy. The term seronegative means that a blood test result does not show the presence of rheumatoid arthritis, and the term spondyloarthropathy means a disease that affects the joints of the spine. These inflammatory disorders affect multiple systems of the body. Other disorders in this category include: Reiter syndrome (reactive arthritis); arthritis associated with inflammatory bowel disease, such as Crohn disease and ulcerative colitis; psoriatic arthritis; undifferentiated spondyloarthropathies; juvenile chronic arthritis; and juvenile-onset ankylosing spondylitis. Ankylosing spondylitis affects a small portion of the world population and is more prevalent in individuals of Northern European ancestry. People with ankylosing spondylitis often have a family member with the disease or one of the other spondyloarthropathy disorders listed above. What Does Ankylosing Spondylitis Look Like? 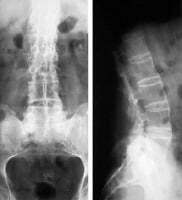 X-ray films of a person with ankylosing spondylitis. The exact cause of ankylosing spondylitis remains unknown. A possible genetic link exists, as the risk of developing ankylosing spondylitis or any other seronegative spondyloarthropathy increases when a family member has the condition. Ankylosing spondylitis and the other spondyloarthropathies have also been linked to a specific protein, HLA-B27, in a person's blood. If this protein is present, the risk of developing ankylosing spondylitis is multiplied 10 times. The specific role this protein plays in the development of ankylosing spondylitis is unclear. Person with ankylosing spondylitis affecting the cervical (neck) and upper thoracic spine. The person's spine has been fused in a flexed position. Patients with AS develop low back pain, hip pain, and stiffness, or both. Later, patients develop upper back pain and pain in the ribs. Symptoms most commonly begin in late adolescence, and males are three times more likely to develop ankylosing spondylitis than females. It is uncommon for patients over 45 years old to develop AS. If symptoms begin in those younger than 16 years, the disease is termed juvenile-onset ankylosing spondylitis, which is more common in Native Americans and in people who live in developing countries. People with ankylosing spondylitis generally complain of back pain of gradual onset that may not become apparent until the condition is well established. The pain progresses with a series of flare-ups and remissions. The back pain is dull and is felt in the hips and buttocks. The pain often begins on one side (unilateral) and comes and goes (intermittent), but as the disease progresses, it becomes more persistent and affects both sides (bilateral). Involvement of the hips and shoulder joints is possible but is more common in juvenile-onset ankylosing spondylitis (patients with onset before age 16 years). Involvement of the jaw (temporomandibular joint, TMJ) can lead to decreased range of motion in the jaw and occurs in some people with ankylosing spondylitis. Involvement of the ribs can lead to decreased range of motion of the chest wall and difficulty expanding the lungs during breathing. Long-term involvement of the spine eventually leads to a progressive decrease in range of motion. Eventually, the bones of the spine grow together and prevent any motion in the affected bones of the back and neck. Involvement of the neck (cervical spine) and upper back (thoracic spine) can lead to fusion of the neck in a downward position (forward flexed) . Fusion of the neck in this position can significantly limit a person's ability to walk because of an inability to look straight ahead or to drive a car without adaptive mirrors because of difficulty turning the head. Inflammation of the iris, the colored part of the eye (acute iritis): Acute iritis occurs in some people with ankylosing spondylitis and generally only affects one eye. Symptoms include pain, increased tearing (lacrimation), sensitivity to light (photophobia), and blurred vision. Inflammation of the aorta, the major blood vessel from the heart (aortitis) and stiffening of the blood vessels (aortic fibrosis): Involvement of the heart is generally occurs in patients that have had AS for a long time. Severe cases can lead to complete heart block or weakening of the aortic valve (aortic valve insufficiency). 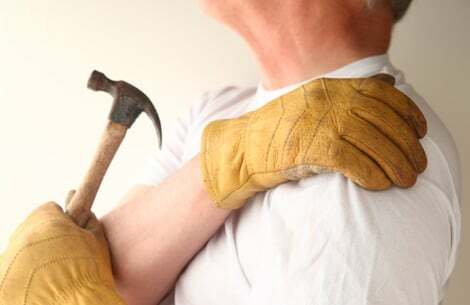 Stiffening of the lungs (pulmonary fibrosis): Involvement of the lungs is made worse by stiffening of the rib joints that limits range of motion of the chest wall. Pulmonary fibrosis generally produces no symptoms. If a chest X-ray film is obtained for another reason, pulmonary fibrosis is a finding that may also show up on the film. Decreased function of the brain, spinal cord, muscles, and nerves (neurologic deficit): Neurologic deficits can be caused by spinal fracture or cauda equina syndrome due to narrowing of the spinal canal (spinal stenosis). Spinal fracture is most common in the neck (cervical spine). People should seek medical care if they believe they have the symptoms of ankylosing spondylitis as described above. Patients with worsening pain and stiffness in the hips and spine that is relieved with exercise may have ankylosing spondylitis. This differs from many other causes of back and hip pain where activity can make the pain worse. A doctor can determine if a person's symptoms are related to ankylosing spondylitis or another seronegative spondyloarthropathy disorder. Many of the symptoms are not specific to ankylosing spondylitis and can result from other causes or can be part of the normal aging process. A doctor can help determine the cause of the symptoms. A doctor begins with a complete medical history and physical exam. The medical history of the person and his or her family members provides possible clues to help determine a diagnosis of AS. It is common for patients with AS to have other family members with AS. Also, symptoms are typically worse in the morning and progressively improve throughout the day and with exercise. The physical exam measures range of motion in the hips and spine. Specific areas of pain or tenderness are examined. A thorough exam should identify any of the associated disorders, including involvement of the eyes, heart, and lungs. A blood test can determine if a person has the protein HLA-B27. A person with this protein has an increased risk of developing ankylosing spondylitis. If it is positive, it may be helpful in diagnosing the condition. However, this blood test may be negative in some people with AS. This test is not necessary to treat the condition and is not commonly ordered by a doctor. Other blood tests may be ordered by a doctor to help rule out other possible causes of the person's symptoms. Blood tests are not very helpful in diagnosing ankylosing spondylitis. A blood test can determine if a person has the protein HLA-B27. A person with this protein has an increased risk of developing ankylosing spondylitis. However, this blood test is not necessary to diagnose or treat the condition and is not commonly ordered by a doctor. Other blood tests may be ordered by a doctor to make sure the patient does not have other disorders that could be causing his or her symptoms. Imaging studies (X-ray films) of the pelvis and the spine are commonly obtained to look at the sacroiliac (SI) joints and hips. The sacroiliac joints must be affected for proper diagnosis of ankylosing spondylitis. X-ray findings in the spine include squaring of the vertebral bodies and formation of bridging bone connecting the vertebrae. X-ray films of other joints may show loss of the normal space between the bones or abnormal curves of the bones (deformities). In people with weakness, decreased feeling in the arms and legs or abnormal reflexes (neurologic findings), an MRI of the spine may be ordered to look at the nerves and spinal cord. It is important for people with AS to understand the disease. Ankylosing spondylitis gradually worsens over time and leads to stiffness and pain in the joints. A good, regular stretching and exercise program can delay these symptoms. People with AS should not smoke because of the increased risk of problems with the lungs. Currently, there is no definitive treatment of or cure for ankylosing spondylitis. Nonsteroidal antiinflammatory medications, such as ibuprofen (Advil or Motrin) or naproxen (Aleve or Naprosyn), are commonly used to decrease inflammation and pain. Aspirin has been shown to have limited benefit for people with ankylosing spondylitis. Oral corticosteroids, such as prednisone (Deltasone or Orasone), are not used for long-term treatment because of the high risk of side effects. Sulfasalazine (Azulfidine) and methotrexate (Rheumatrex) are effective in some people with affected extremities (peripheral involvement) with ankylosing spondylitis. Sulfasalazine is useful in people who also have inflammatory bowel disease. Patients with AS are thought to produce excessive amounts of the protein tumor necrosis factor (TNF). Drugs that block TNF, such as infliximab (Remicade) and etanercept (Enbrel), are also used to treat ankylosing spondylitis. These drugs target and may alter the disease process. Since some studies have suggested an association between AS and infection by certain bacteria, including enterobacteria, some patients have been treated with the antibiotic moxifloxacin and had good pain relief. However, this treatment is not yet widely used. People with involvement of other systems should see the appropriate specialists (for example, an ophthalmologist for the eyes; a pulmonologist for the lungs; and a cardiologist for the heart). Those with a painful red eye should see an ophthalmologist immediately. Genetic counseling and support groups are useful in further educating people about the disease and in predicting those who may be at increased risk. For more information on medications, see Understanding Ankylosing Spondylitis Medications. In most cases, surgery is not necessary for people with AS. Surgery is performed to decrease the risk of complications of AS. Surgery for AS does not cure the disorder. People with significant involvement of the neck (cervical spine) or upper back (thoracic spine) may have significant impairment in the line of sight, eating, and psychological well-being. These people may benefit from a realignment of the spine to allow the person to straighten the head and look forward (extension osteotomy). This procedure is difficult and has multiple associated risks, but if successful, it allows the person to return to a more functional life. The bones of the spine can grow together, preventing motion in the neck and back (autofusion). Patients that develop an increase in the amount of motion in the neck or back should be treated cautiously and should be considered to have developed a spinal fracture. X-rays are often obtained to determine if a fracture has occurred. In this case, surgery might be necessary to reduce the risk of injury to the nerves or spinal cord (neurologic complications). People who develop bowel or bladder dysfunction should be evaluated immediately with an MRI to assess for possible cauda equina syndrome caused by narrowing of the spinal canal (spinal stenosis). This is an emergency requiring surgery within 48 hours to prevent permanent loss of function. People with significant involvement of the hips or knees may need hip or knee replacement surgery as the disease worsens and they develop less motion and more pain. Excess new bone formation may occur after surgery and gradually decrease joint function so that another surgery is required. People with ankylosing spondylitis should have regular follow-up visits with their doctor to identify any new symptoms related to the disease and to determine if additional treatment is needed. Currently, no method of preventing ankylosing spondylitis exists. However, a good stretching and exercise program can delay the normal disease progression. Spondylitis Association of America, "Ankylosing Spondylitis"
Back view of a person with ankylosing spondylitis affecting the cervical (neck) and upper thoracic spine. The person's spine has been fused spontaneously in a flexed position. X-ray film of the sacroiliac joint of a person with ankylosing spondylitis. X-ray film of the spine of a person with ankylosing spondylitis. X-ray film of the spine of a person with ankylosing spondylitis. Ossification (bone formation) of the annulus fibrosis (outer ring of the intervertebral disk) and squaring of the vertebral bodies have occurred. X-ray films of a hand and an arm of a person with ankylosing spondylitis. Fusion of the joint spaces and deformity have occurred. MRI of the spine of a person with ankylosing spondylitis. Degenerative disk disease and bridging osteophytes (bone spurs) have occurred. X-ray film showing a vertebral fracture in a person with ankylosing spondylitis. "Clinical manifestations of ankylosing spondylitis in adults"
What symptoms of Ankylosing Spondylitis have you experienced? What treatment did you receive for Ankylosing Spondylitis?